As juice only has trace amounts of fibre, the nutrients are able to enter the blood stream rapidly and be quickly absorbed. Without fibre, your digestive system is furthermore allowed to rest; this vital energy reserve can be used for the detoxifying process. 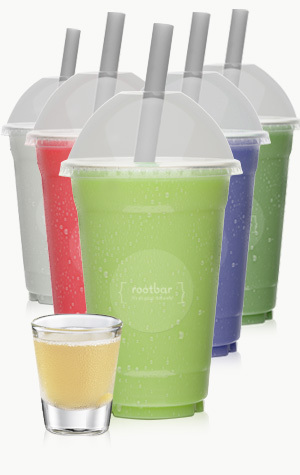 However we at Rootbar believe that fiber is also important and it is important not to overload your system with fruit sugars potent vegtable juice. They could make you feel slightly green!! Therefore a mix of juices and blends or only blends is also a good place to start. We believe it’s important to build a relationship with what you consume. That’s why our recipes are more than just a list of ingredients, but a course in micro-biology. 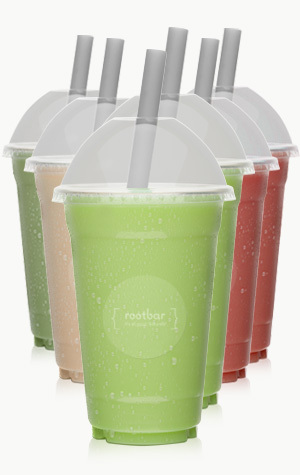 As you blend, you’ll learn how our carefully crafted smoothies will nourish your body and mind. That’s knowledge you can taste. You are what you drink. 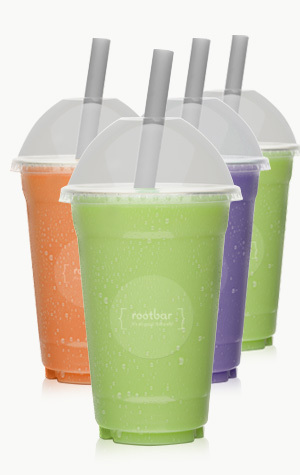 Our smoothies are packed with essential vitamins, minerals, antioxidants, proteins and fiber. Their benefits are endless: clearer skin, heightened mental clarity, increased energy, and weight loss. And, their nutrients are known to reduce the risk of cancer and heart disease. Our blends are made fresh every morning with premium ingredients that are never pressed, preserved, or pasteurized. We blend whole fruits and veggies, as well as nuts, seeds and superfoods, to ensure a balance of essential ingredients. Our product is similar to what you would find in your own kitchen, and unlike anything you see on the shelf of a retail store. Amidst all the fads, the detox diets, and the buzzword health claims, our blends aim to do something simple, but astonishingly powerful: put your stomach, and your mind, at ease.